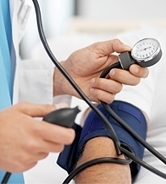 High blood pressure (hypertension) is a leading health risk for many Americans. Your diet and make a huge impact on your blood pressure. Some people are able to eliminate medication entirely after they reset their diet and exercise habits. Here are some things to consider if you are dealing with high blood pressure. High blood pressure and excessive body weight go hand in hand. Most people who are diagnosed with high blood pressure are immediately told to lose weight by their doctor. Weight loss, while never easy, is especially important when you are dealing with high blood pressure. High blood pressure places an extreme burden on your body, especially your heart, and increases your chances of stroke. When your doctor tells you to lose weight to reduce your high blood pressure, chances are you will be encouraged to reduce your intake of salt, fat and alcohol. You may also be encouraged to increase your consumption of fruits, vegetables and lean meats that are high in potassium and magnesium. These minerals can help to control your blood pressure. That means that you should target nuts, seeds, legumes, potatoes, spinach, zucchini, cantaloupe, bananas, watermelon and oranges. Note that some high blood pressure medications are sensitive to your potassium levels, so check in with your doctor on interactions. As always, check the packaging to see what the manufacturer considers a serving. Many times our impression of a serving is a bit higher than the manufacturer's. That can lead to inadvertent consumption of too much sodium. Alcohol raises blood pressure. That is sad, but true. For people with high blood pressure, alcohol can also damage the walls of your blood vessels, a double whammy. These effects far outweigh the slightly positive impact of moderate alcohol consumption on heart heath. A sad truth, but this may also be a good motivator for sticking with your diet. Once your weight is down and your blood pressure is back into line, you can enjoy that glass of wine with dinner again! The third leg of the blood pressure diet is reducing your fat intake. Saturated fats (especially trans-fats) are hard on your heart and blood vessels. With high blood pressure, these negative impacts are amplified. Eating a low fat diet and substituting unsaturated fats can really make a positive difference. These dietary changes for treating high blood pressure are considered so important that the National Institutes of Health commissioned the Dietary Approaches to Stop Hypertension. This DASH diet has all the detailed instructions that you need to revise your eating habits, control your weight and get your blood pressure back in line so that you can live life to the fullest!